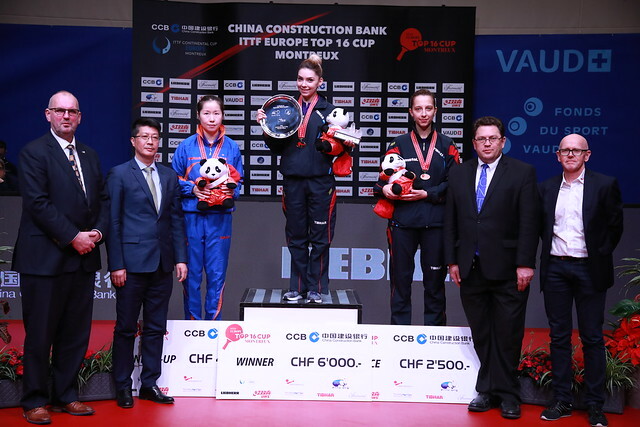 32 of Europe’s finest players took to the tables in the Swiss city of Montreux on Saturday 3rd February for the opening day of play at the China Construction Bank 2018 ITTF-Europe Top 16 Cup and as anticipated there was plenty of drama. Upsets, comebacks, close shaves, day one had it all - so here’s a look back at how the action unfolded. Matilda Ekholm and Bernadette Szocs have reached the last four of the Europe Top 16 Cup for the first time in their careers following successful outings from the Swedish and Romanian competitors on day one of the Women’s Singles tournament. Both players came through the day’s action without dropping a single game between them. In the quarter-finals Ekholm accounted for no.5 seed Sofia Polcanova (11-5, 11-6, 11-7, 11-9) while Szocs defied the odds to oust fourth seed Georgina Pota from the competition with a powerful display (11-7, 11-6, 11-5, 12-10). Another Romanian contestant through to the penultimate stage of the Women’s Singles draw is Elizabeta Samara. Facing Ni Xialian in the last 16, Samara required the full seven games distance to see off the Luxembourg pen-holder in a tight match (11-9, 14-12, 9-11, 11-7, 8-11, 5-11, 11-5) but the Romanian fared much better in the evening session of play, claiming a promising victory over three-time champion Liu Jia (11-4, 7-11, 11-3, 11-7, 13-11). Li Jie can be happy with her day’s work after the Dutch representative overcame challenges from Russia’s Polina Mikhailova (11-2, 11-7, 13-11, 11-6) and Germany’s Sabine Winter (11-5, 11-4, 10-12, 11-5, 11-8) to set up a meeting with Elizabeta Samara. One of the standout performers on day one of the Men’s Singles event was Jonathan Groth, the no.9 seed, who negotiated two difficult fixtures to guarantee a top four finish in Montreux. The Dane got his campaign off to a flying start with a strong outing against Portugal’s Tiago Apolonia (11-5, 11-9, 11-8, 7-11, 11-7). It was Groth’s quarter-finals performance which took the spotlight as he impressed against last year’s runner up Alexander Shibaev (9-11, 11-6, 11-6, 11-5, 12-10) to eliminate the Russian competitor from the tournament. Groth will play the defending champion in the semi-finals after Dimitrij Ovtcharov came through a tough encounter with Greek defender Panagiotis Gionis (11-7, 12-10, 7-11, 11-9, 13-11). Fourth seed Vladimir Samsonov enjoyed a positive day in Montreux: the Belarusian competitor secured back-to-back victories against Swedish opposition. Opening his account with a terrific Round of 16 comeback against Kristian Karlsson (10-12, 9-11, 11-3, 8-11, 11-7, 11-6, 11-7), Samsonov then went on to inflict a five games defeat on Mattias Karlsson (11-9, 11-8, 11-7, 10-12, 14-12) to seal his spot in the last four. 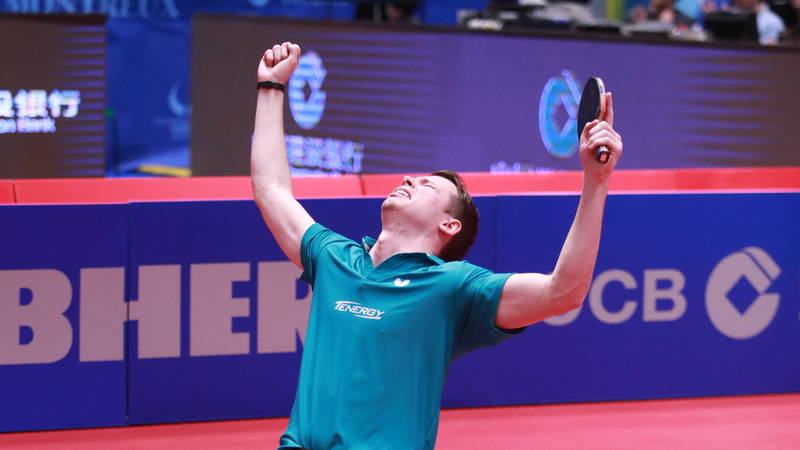 Timo Boll and Bastian Steger earned opening round wins over Austria’s Stefan Fegerl (11-7, 13-11, 11-4, 11-8) and European champion Emmanuel Lebesson (6-11, 10-12, 11-7, 11-5, 11-9, 11-4) respectively, to force an all-German quarter-finals tie at the bottom of the draw. Eighth seed Steger put up a brave fight but it was Boll who progressed (11-7, 9-11, 11-5, 13-11, 11-6).